Feline Natural premium canned cat food contains all the goodness of our existing product ranges in a convenient, ready to use can. 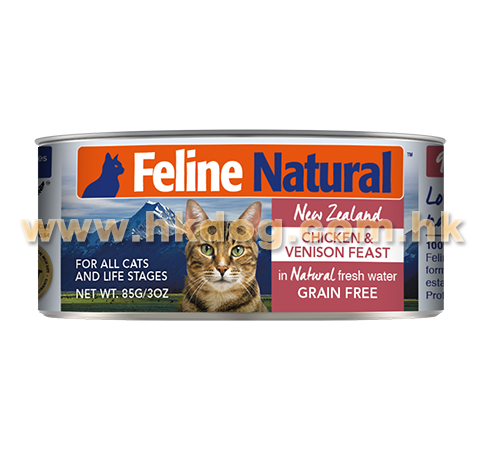 Our canned cat food is FREE from all gelling agents, the only thing we add is Natural Fresh New Zealand Water. Simply pop the top and drop the contents out with ease and no mess. 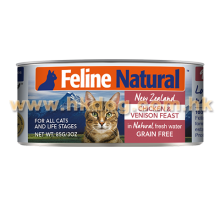 Packed with New Zealand wholefood ingredients and selected essential vitamins, minerals and oils – the perfect balanced diet or ideal nutrient rich high meat boost to add to a cats existing diet. Chicken, Chicken Heart, Venison Kidney, Venison Liver, Venison Blood, Flaxseed Flakes, New Zealand Green Mussel, Dried Kelp, Taurine, Vitamin E Supplement, Magnesium Oxide, Zinc Proteinate, Copper Proteinate, Manganese Proteinate, Thiamine Mononitrate, Vitamin D3 Supplement, Folic Acid. Water added for processing.